Anoatubby was born on November 8, 1945, and was raised in Tishomingo, Oklahoma. The proud Chickasaw graduated from Tishomingo High School in 1964 and went on to obtain an associate’s degree in business from Murray State College in 1970. Anoatubby served in the Oklahoma Army National Guard during this time and achieved the rank of staff sergeant before he left with an honorable discharge in 1971. He earned his bachelor’s degree in accounting at East Central College in 1972. Anoatubby also completed additional studies in business and finance at Southeastern State University and East Central University. He first started working for the Chickasaw Nation in 1975 as the director of tribal health services in Sulphur, Oklahoma. He then went on to become the director of the tribal accounting department. In 1978, he was chosen to be the special assistant to the governor and controller of the Chickasaw Nation, and then the following year, he was elected lieutenant governor of the Chickasaw Nation. He was elected the 30th governor of the Chickasaw Nation in 1987. The highly esteemed Chickasaw leader has since been reelected in every election and is currently serving his seventh term. Anoatubby presides over more than 50 different government programs, 13 tribal businesses, manages over 12,000 employees and is responsible for the $350 million yearly budget. 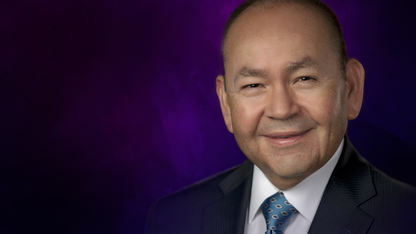 Governor Anoatubby has dedicated his efforts to improving the Chickasaw Nation’s finances, education, economic development, environmental protection and healthcare. As governor, Anoatubby has encouraged self-sufficiency for the Chickasaw Nation and its people. Under his leadership, the tribe is well on its way to achieving this objective. Tribal assets have increased dramatically, and the Chickasaw Nation has become one of the first Native American governments in the U.S. to be designated as an A-102 tribe, with a superior rating for both management and fiscal controls.